SOS dogs in our shelters or foster homes are given the best possible love and care we can provide. However despite the tireless dedication of our volunteers it is impossible to give them all the individual attention they deserve. If you are able to adopt one of these wonderful dogs we would love to hear from you – the rewards in love and loyalty are huge. It is very important to us that we match the right dogs with the right families. Over the years we have developed a concise adoption process which we would ask you to work through with us for the benefit of all involved. Please feel free to ask questions at any stage and we will endeavour to reply as quickly as possible. Please note however that all of our staff are volunteers with full time jobs so we ask that you give us 7-14 days to process your application. Working hours: Although ideally it would be wonderful if everyone was at home all day to be with the dog, in the real world we appreciate this is quite a rarity unless you are lucky enough to be retired. We do try to be flexible about people’s working hours, but would require that a dog is not left alone for more than a period of 4 hours at any one stretch. If people work full-time and want to pop home during their lunch break to let the dog out this is not considered ideal, and definitely not considered at all in the case of puppies and very young dogs. There are occasionally exceptions to this and some dogs may be able to cope in this situation, but it is not something we normally like to encourage. A dog walker or doggie crèche can sometimes be adequate, dependant upon the dog, but then please bear in mind how much time you have to give to a sometimes already neglected dog – do you really have the time for a dog if you work full-time? Babies & young children: We do not have any strict rules regarding the ages of children, however, it is not always advisable to introduce a rescue dog into a home with babies or young toddlers. Most mums of very young families do not have the time to devote to the training or exercise required for a rescue dog, especially a puppy. 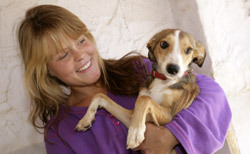 However, once children are of an age to understand how to respect a dog in the home, many people feel it is an essential part of a child’s development to grow up with animals and so each case is assessed individually and would rely upon peoples experience, a child’s previous experience and the nature of the dog. Unfortunately some of our dogs are afraid of young children as they have suffered abuse or cruelty at the hands of children, and so can never be placed in a home with young children. All children must be taught respect for the dog and taught not to tease. To bring a young, bouncy, heavy, boisterous puppy into your home which maybe uses it’s teeth and scratches when it jumps up, could spell disaster in an inexperienced home. However, a calm gentle dog which is not worried by the screeches of children could quite easily adapt to being a great companion. Fencing: We do require that you have a secure area to exercise the dog – we understand that not everyone has 6ft panel fencing around their garden, but, depending on the size & agility of the dog this is something which is assessed individually. There must be no gaps which a dog could squeeze through, and hedges alone are not normally sufficient and would require some form of wire behind. Please bear in mind that a Podenco is a hunter and very agile so can clear a fence with no problem if it decides to give chase. It is also an extremely good escape artist, and so for this reason we require very adequate fencing for the hunting breeds. House-training: As a lot of our dogs are kept in a kennel environment they are often not house-trained and so would require patience & understanding in this area. You may wish to consider the facilities you have for house training – a door opening onto a garden is ideal. It obviously becomes more difficult to home a dog in a flat without immediate access to a garden, but some of our dogs live in foster homes and therefore are often well on their way to being house-trained, however it is not advisable to have a puppy or a dog which is not house-trained in a flat which is not on the ground level unless you have considerable experience or sufficient facilities to cope. Most of our dogs learn quickly and do not present too many problems – some simply require more time than others. Separation Anxiety: Due to the sometimes extreme cruelty that our dogs have been subjected to they are often traumatised, nervous and frightened, and it can take time for them to overcome their fears and anxieties. Our volunteers in Spain work hard to rehabilitate them to the point where we feel they are ready to cope with life in the UK. However, as a consequence some of our dogs can suffer from separation anxiety as they have always been with other dogs and are not used to being left entirely alone. Therefore they require patience and understanding during the settling in period whilst adjusting to life as an only dog. Whilst the majority of dogs normally adjust to their new life without too many problems, some dogs will always need to be placed in a home with another dog for confidence. Lead-training: We are able to train most of the dogs on the lead as they are taken for daily walks. However, we don’t have the facilities at our shelter in Spain to test our dogs off-lead and so cannot guarantee how good their recall will be. Whilst this isn’t normally a problem for most dogs after some basic training, please do bear in mind that a Podenco has appalling recall, and whilst some can be absolutely fine for the majority of the time, if it sees a rabbit, squirel, etc, then it’s fair game and once the nose is down you may not see it again for quite some time – no matter how well trained you think it is !! Existing dogs: You must be sure of your dog’s temperament and confident that it will accept another dog into your home. This is especially important if you are taking a dog straight from Spain without meeting it beforehand. If the dog is in a foster home in the UK you will be required to take any existing dogs to meet it to ensure they are compatible. Spaying & Neutering: Any existing dogs in your household must be spayed or neutered. There are sometimes exceptions to this ie. medical reasons or if a dog is much too old. All dogs coming from Spain will already have been spayed or neutered provided they are old enough. Cats: We do not have the facilities to ‘cat test’ our dogs whilst they are in Spain, and so it is almost impossible to assess how a dog will react to a cat once in your home. However, we do not normally encounter any problems with this and most dogs adjust to life with a cat as part of their pack. There are of course exceptions if we think a dog has a particularly strong hunting instinct or is known to hate cats we will of course advise you. Puppies would adapt quite easily, and older dogs can normally be taught to respect your cat. LASTLY: Please note that we try our best to be as accurate as we possibly can with information gained about each dog, and are continually liaising with all volunteers directly involved with the dogs. However, it is often quite difficult for us to assess some of the above points or how big a puppy will grow, and so cannot give any guarantees as the dogs are constantly changing and adapting to their new surroundings. However, we pride ourselves on our success rate and have many loyal followers and happy owners and happy dogs. Please complete our Pre-adoption Form (here) for the dog(s) you like. We will then get in touch with you via email as soon as we can. We will clarify any points and give you more information about the dog(s). We will also ask for photos of your house and garden. The next step would be to arrange a home check. It is vital that we match our dogs to the best home possible, and we take great care in ensuring that the needs of a dog are fully met by the new family. After the home check we will arrange for you to visit the dog. If all goes well a following visit would be arranged for you to pick up your new family member. 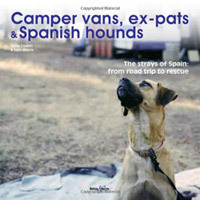 If the dog is in Spain we will arrange for it to be picked up by the new family when the dog travels to the UK. SOS Animals UK provide lifelong rescue back-up and support for the new family. All the dogs are full vaccinated, microchipped and tested for the main Mediterranean diseases. They have full European passports* and, where old enough, will have been sterilised. We ask for an adoption fee of £250.00 for dogs from Spain, and £150 for dogs from the UK. This ensures that we can carry on doing the work we do. Potential adopters should be aware that adopting a rescue dog can sometimes be challenging. The dog will obviously need time and patience to settle. We will give you help and advice at every step of the way. You will be rewarded a million times over by the love and affection of your new dog!